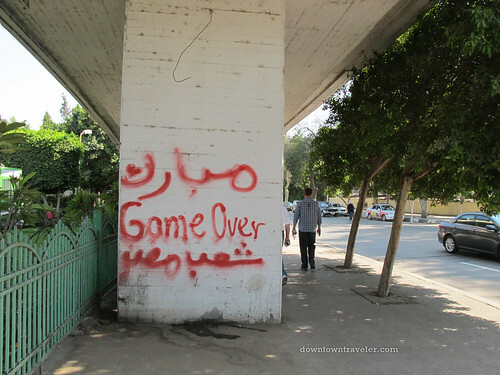 Last week I posted a photo essay of revolutionary Cairo street art. Since I don’t read Arabic, I wasn’t sure of the meaning behind the artwork. Fortunately, readers jumped in with translations that shed light on these powerful works of art. Scroll down for explanations of last week’s street art and for additional images. Special thanks to Lena Olofsson of Galaxia Tours, Giulia Cimarosti of Travel Reportage and Dave of The Longest Way Home for sharing their insights with us! I thought this symbol contained an ancient Egyptian ankh, but it’s actually a Christian cross. The combination of the crescent and cross is meant to promote religious tolerance, and appears throughout Cairo in various forms. It’s refreshing to see a symbol of religious harmony in Cairo, considering recent news reports of sectarian clashes. Over the weekend, a violent fight between Christian and Muslim groups resulted in 12 deaths. While news reports focus on religious conflicts, there are clearly Egyptians who embrace tolerance. Dave, a blogger who has lived in Turkey, Iran and Pakistan during a six-year journey around the world, also identified a message of unity. 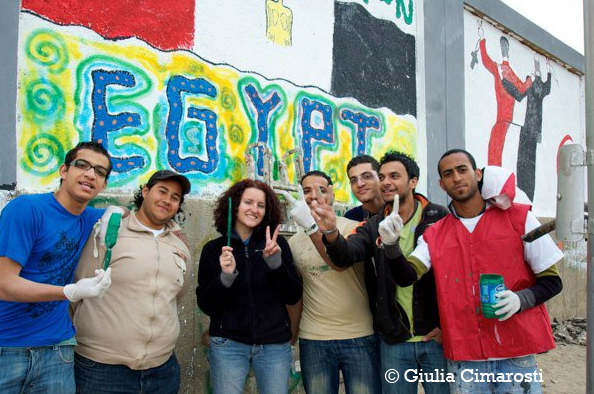 In March, Giulia of Travel Reportage accompanied a group of young Egyptians as they decorated the Zahraa el Maadi neighborhood with street art. 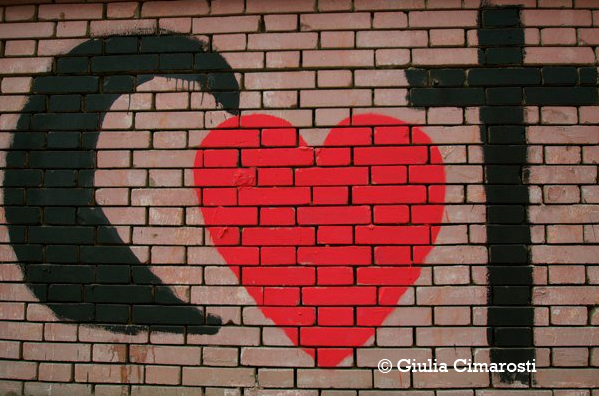 Several of the murals promoted religious tolerance, like this “Muslims Love Christians” piece. 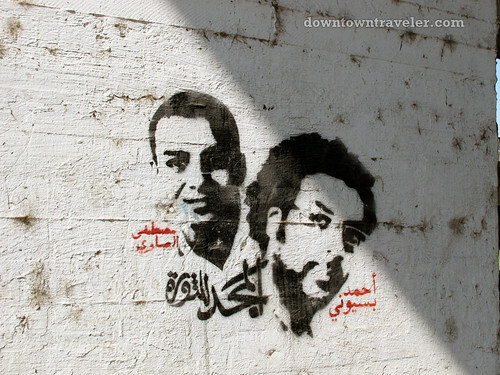 Several of the street art murals I featured last week are tributes to Egyptians who were killed during the revolution. 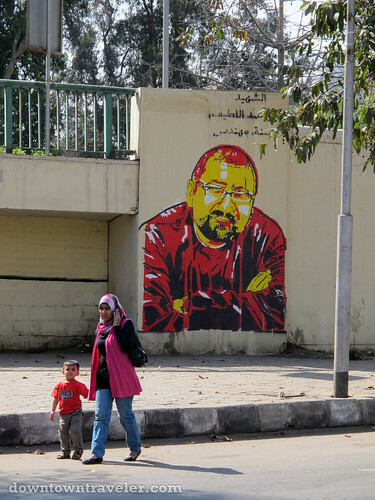 This mural honors Abd el Latif, an engineer and “martyr” of the revolution, Lena Olofsson explained in an email. Lena identified the men in this artwork as Mustafa El Sawi and Ahmed Bassiyouni, two Egyptians who lost their lives in the revolution. The text reads “glory to the revolution” and lists their names. (For more information on the victims, visit 1000memories.com). This is the latest in a series of reports on the “Restoring the Journey” trip that brought US tourism leaders to Egypt and Jordan to investigate travel safety. I accompanied the delegation, which was sponsored by local tourism ministries. Follow Downtown Traveler on Twitter, Facebook and Flickr for photos and videos of the trip, and look for the hashtag #SafeME on Twitter. Refreshing, positive use of art in Egypt. Glad that some people there are looking to create peace. Great sign for the county! This makes me so happy. I’m hoping that Egypt can lead the international community in being tolerant and united. I remember when Giulia was exploring the region. It was just so peaceful moment. Sometimes I feel it’s so sad and stupid, to fight over religion. It is a really important aspects of life but why people should fight over what they are believing in? Why don’t we just accept who we are and be well together. Good to see all the feed back 🙂 Looks like I nailed my one (phew), many thanks for asking. And, again, it’s great to see someone taking such a different approach to writing about the Egypt!! I thought the original article and followup were very encouraging. 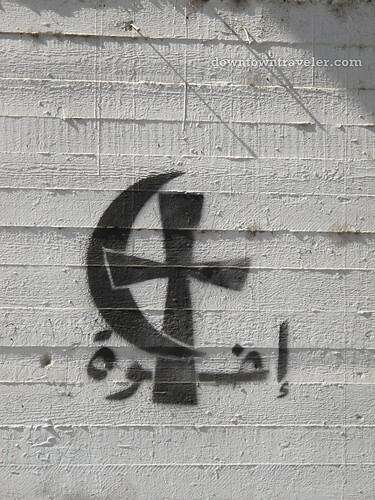 It’s good to know that there are people in Egypt who believe Christians and Moslems can co-exist. There have been interesting discussions on radio’s “The Takeaway” about this topic, and the split in the Moslem Brotherhood between the older hard liners and the youth, who want a secular state where all religions are tolerated. 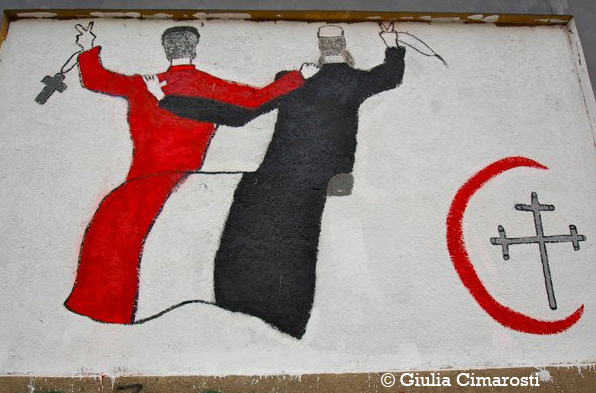 That is awesome that travel bloggers stepped up to assist in deciphering the meaning of the street art in Egypt. So true. Bloggers are a great resource for travel information, and now we know they have insight into artwork too! I was also surprised by the uplifting message of the street art, and the optimistic spirit in Cairo. Locals were proud of the revolution and seemed to have high hopes for the future! Love political street art. Trust you to find it. It’s great your readers helped you figure out the meaning of the words and art. Very interesting.